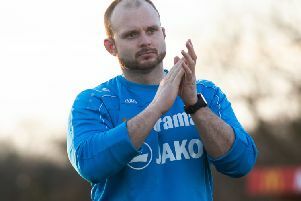 Hemel Town suffered their first away defeat in the league this season as they slumped to a 2-0 defeat at bottom of the table side Basingstoke Town . Goals from Chris Flood and Louie Soares did the damage for Basingstoke, either side of a reckless straight red card for Hemel debutant Nikolay Todarov. The home side pressed forward from the off, with Manny Williams forcing Jamie Butler into a save after two minutes, while new boy Luke Thomas looked lively for the visitors. He produced a fine left-footed shot which Aaron Howe did well to save and then soon after, he hit another well-struck effort just over the bar. Another new Hemel signing, Mitch Brundle, was booked soon afterwards for a poor tackle on Jamie Brown, who hobbled off the pitch to be replaces by Soares. Chances were few and far between in the first half, but Basingstoke took the lead just five minutes after half-time as Tom Bird crossed for Flood to head home past Butler. The home side nearly doubled their advantage soon afterwards, but Williams’ strike went just the wrong side of the goal. The defining moment of the game came in the 68th minute when Nottingham Forst loanee Todarov was given his marching orders after petulantly lashing out against Tom Bird, giving the referee little option but to brandish the red card. The 10-man Tudors were quickly punished, as three minutes later Soares made it 2-0 when he lashed home from the edge of the area after a corner was only partially cleared. A minute later, Basingstoke nearly added a third as Williams’ shot was put behind for a corner by Louis John, with the Hemel defender pulling his hamstring in the process and limping off. Further chances came and went for the hosts, with Butler pulling off a couple of excellent saves, and Hemel were left with plenty to think about as they trudged home empty-handed.